I was introduced to the concept of music streaming and the products to do it, by a customer who loves his gadgets, and I have to say, I was really impressed. The end result is that you can wander through your house with your iPhone or hand held controller, and control the music playing in each room. 1. Connect the lounge sound system to a client wifi device. 2. Connect the kitchen hifi to a client wifi. 3. Tell the system which device is which. 4. Take the controller around and choose some music to play. 5. You can play different track in different rooms. The key thing is - no wires. The initial bundle you get will let you stream your music to two rooms. 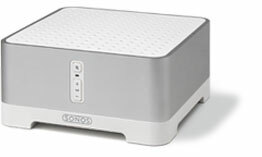 Sonos Startup Bundle. You can see the main devices here, with the hand held controller on the left, the amplifier set back and the remote device to the right. You can also control all the zones using the included application that runs on your PC. 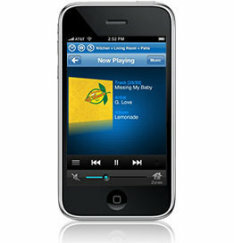 Sonos Working on iPhone. The iPhone application will let you access the Sonos wifi system in your house and choose - pause - stop your music. The Zoneplayer 120 (ZP120) is the main stay amplifier with analogue outputs to stream your music. Also has a sub woofer output!